I just had to tell you about a yarn store, A KNITTED PEACE, in Littleton, Colorado, which is near and dear to my heart. I worked there for a number of years. As a matter of fact, I was the first teacher hired that wasn't a family member when the shop opened in 2001 and I also handled Thursday night's knitting help sessions. It's a wonderful store. The ladies who work there, which includes the owners of course, are amazing in both their knowledge and friendliness. The knitting groups (Monday afternoons, first Tuesday evenings and Friday nights) are welcoming and a great place to sit and chat and meet other knitters. Can you tell that I miss A Knitted Peace? I really do and when I go back to Denver for a visit, I'll be stopping in to my favorite shop. Hours: 10 a.m.-6 p.m. Mon., Tues., Wed.; 10 a.m.-7 p.m. Thurs. ; 10 a.m.-8 p.m. Fri.; 10 a.m.-5 p.m. Sat. 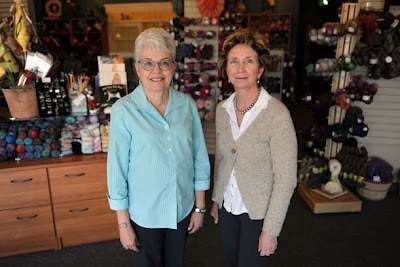 We are both dedicated knitters who had worked for the store under a previous owner. When the store went up for sale in 2006, we were both interested and decided to join up and buy it. It’s great to have two of us because with a small business there’s always something that needs doing — ALWAYS. The expertise of our staff is really remarkable — it’s like the MIT of knitting at our store. We are able to help our knitters and crocheters choose the right yarn and needles, get past difficulties and successfully finish their project, whether it’s an afghan, a sweater or a baby blanket. Our teachers all work in the store and are there to help customers every day, and we offer free knitting help sessions every Thursday from 4:30 to 7 p.m. Among the seven of us, we have a couple of centuries’ worth of knitting experience and if we don’t know the answer, we can generally find it or figure it out. The yarn. All the colors and textures, the possibility of creating something special, really make coming to work fun every day. We are also fortunate in having really wonderful customers that we enjoy working with and helping. And we have learned that in addition to knitting teachers, we are sometimes counselors and a friendly ear. Keeping our projects affordable in an era of price increases in the fiber industry. Oh, we’re full of surprises. Our customers might not know that Marsha is a clarinetist who plays in a band and is a member of her church choir. Jane reviewed mysteries for the Rocky Mountain News before its demise and can be counted on for a book recommendation anytime.